This review has been sitting in my drafts covered in cobwebs and dust desperate for me to finish up and post, so here it is! This mascara was my daily lash love until I got my hands on Maybelline's Falsies. You should be able to find this mascara anywhere that sells Rimmel make-up and at drugstores such as Superdrug and Boots for just £6.99 which is very reasonable. Rimmel do a variety of these Scandal'Eyes mascaras but I own the waterproof version otherwise I'd turn into a panda. I find it difficult to come across a drug store waterproof mascara that I enjoy but for now, this one's doing the job. The main reason that got me reaching for this mascara in the shop is the fabulous orange colour that Rimmel have made the tube, which may be tacky but at least I can find it in my handbag! When taking the brush out of the tube there are often clumps on parts of the brush and though I tend to wipe the clumps off on the tube it is a negative but that can be outweighed by how well the mascara brush glides over each lash, covering each one equally even the little ones in the corners. It's easy to build the layers up without becoming too clumpy . 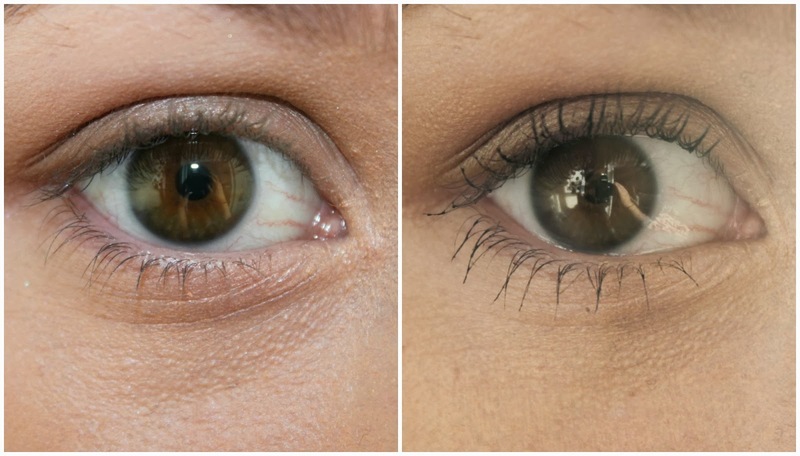 As shown in the above pictures the product does make quite a difference, every lash stands out and is lengthened. The main issue with this mascara is that it tends to take a while to dry after applying, therefore you have to wait for it to be dry enough before carrying on with your make-up otherwise it's prone to smudges. For a cheap mascara that makes a difference, it's great! For a mascara that makes you fall in love it's not so great. It' one that for now I can say "it'll do". Do you like this mascara or is it a big no from you?